I've seen claims that Hitler based his "final solution" on his knowledge of the American genocide of Indians. But I hadn't seen any hard evidence of it. This passage comes closer to explaining the connection than anything I've seen so far. By Leon DonnellyThe German Friedrich Ratzel in his book “Lebensraum,” 1901, wrote of an impersonal, Darwinist ‘survival of the fittest’ struggle for existence among human beings. In considering the near extinction of Native American Indigenous peoples by Euro-American conquerors he saw in this a model for German racial expansion, conquest and extermination in the eastern lands of Europe. Ratzel wanted Germany to emulate the American model of aggressive conquest of all indigenous peoples that stood in Germany’s path of acquiring ‘living space’ in the East for her ever expanding ‘pure white Germanic race’, and so recommended aggressive war of acquisition and conquest which “quickly and completely displace the inhabitants, for which North America, Southern Brazil, Tasmania, and New Zealand provide the best examples.” Then, following these models, settler colonies could quickly be founded with a German yeomanry farmer class protected by forts and military units. It was upon this basis that Adolf Hitler formed Germany’s policy of aggressive acquisition & conquest in the East of Europe & Russia. In Nazi propaganda film and newspaper photographs of the Nazi colonisation of Eastern Europe German wagons rolling East were shown in conscious echo of images derived from Hollywood Western films celebrating Manifest Destiny and the conquest of the American West. Ratzel was praising of American historian Frederick Jackson Turner who formulated his “Frontier Thesis” of American History in his essay “The Significance of the Frontier in American History” (1893), which celebrated the irresistible march of white Anglo-Saxon civilisation across the North American continent as an evolutionary process, and highlighted Turner’s contrast of the “dynamic borders of American Westward expansion” with the static borders of densely populated Europe. I quote from Wikipedia on Turner: “He believed the spirit and success of the United States was directly tied to the country’s westward expansion. Turner expounded an evolutionary model; he had been influenced by work with geologists at Wisconsin. The West, not the East, was where distinctively American characteristics emerged. The forging of the unique and rugged American identity occurred at the juncture between the civilization of settlement and the savagery of wilderness. This produced a new type of citizen–one with the power to tame the wild and one upon whom the wild had conferred strength and individuality…As each generation of pioneers moved 50 to 100 miles west, they abandoned useless European practices, institutions and ideas, and instead found new solutions to new problems created by their new environment. Over multiple generations, the frontier produced characteristics of informality, violence, crudeness, democracy and initiative that the world recognized as “American.” According to Wikipedia by the time Turner died in 1932 60% of the leading History departments in the US were teaching American History courses in Frontier History along Turnerian lines. Adolf Hitler himself saw in the American conquest of the West a model for Germany’s conquest of the East to achieve her divine right of “Lebensraum” there. In “Mein Kampf” Hitler sees the American expansion into the West as an expression of white Anglo-Saxon Germanic racial superiority. Hitler commends these American settlers for keeping their Germanic blood pure by not intermarrying with Native peoples, and drew from it his own version of Manifest Destiny where German blood has the divine right to conquer land inhabited by “untermensch,” who are not to be considered human beings by the Germanic conqueror but are to be mercilessly starved, slaughtered and for all intents and purposes made extinct for the purposes of “Lebensraum” for the “pure white race” of the Greater German Reich. American National Socialists know what “Manifest Destiny” means. The Klu Klux Klan will know. And the Native Americans know what it means. Genocide. Genocide of the Native American people. In the year in which UN Special Reporteur on Indigenous Human Rights, James Anaya, has alerted the world to widespread Human Rights abuses against the Native Americans, presently & historically, the need to return to them stolen lands and to redress the traumatic historical effects of Manifest Destiny, this seems a curious & perverse slogan for Gap to offer the world.Comment: For more on Manifest Destiny, see Bono Mack: Pro-Indian = Anti-American and McNairy Apologizes for "Manifest Destiny" T-Shirt. I wonder if he based at least as much of it on what happened closer to home. The Turkish regime eliminating Armenians and Greeks from its little empire earlier in the 20th century. And his fellow socialists from the USSR wiping out and moving millions. 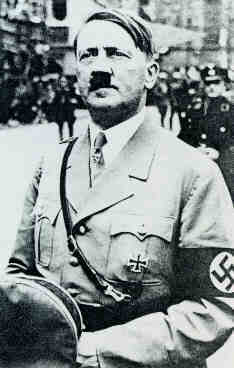 Hitler's actually reported as saying "No one remembers [what the Turks did to] the Armenians. ", so I'd have to agree, dmarks. Oddly, Nazi ideology made a big deal out of noble savagery too. Which kinda makes sense, since you can see elements of it in Caesar's Commentarii de Bello Gallico. Where this breaks down, however, is that the noble savage himself goes back to Gilgamesh, and no doubt Sumerians felt the same of their neighbors. In short, an "other" in tune with nature is as old as Western civilization itself.